If the guests who stayed at the Hall that week could come back to life, they would find it a quite different place now. Since the house has been empty, it’s suffered a lot of wear and tear. Theft of roof lead had exposed the interior to the wind and rain; urgent repairs by Rochdale Council have saved it from ruin. Middleton Archaeological Society is currently researching Hopwood Hall and its place in the history of Middleton. 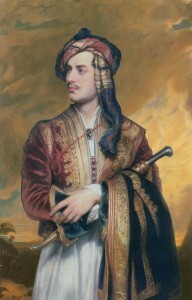 Baron Byron of Rochdale – his family had lived in the Rochdale area up to the 1600’s – was the most famous man of his times. A world-wide best-selling poet, he was known for his good looks, his charm and his reckless personality. The nearest modern equivalent would be a cross between Elvis, Stephen King and Pete Doherty. Called ‘mad, bad and dangerous’, he seemed to seek out scandal and had to leave England when he was 28. He never returned. A fellow guest at Hopwood Hall in 1811 described Byron before he became famous and image-conscious: she tells us of ‘an extraordinary creature’, shy, diet-obsessed oddly dressed and yet ‘gentle and good’. ‘He is an extraordinary creature… he declined coming to dinner as he said it was his starving day. Every other day he only eats a biscuit, fruit, etc., …he was once, he says, a great size. He is twenty-two, and lord of Rochdale… pale and languid looking (with) fine large blue eyes, but they are so wild and odd that I have no doubt, if he lives, he will be mad. Byron was a famous liberal and a supporter of human rights against the power of repressive governments. 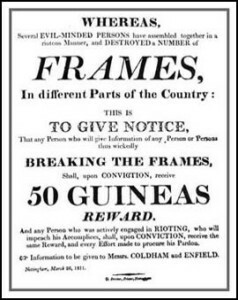 In 1811, the ‘Luddites’, angered at wage reductions, destroyed hundreds of stocking frame machines. 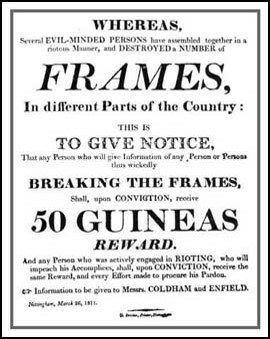 To help catch these ‘frame breakers’ the Govern ment offered 50 guineas to informers – a fortune for working people. But despite this frame-breaking spread through the North and Midlands. In 1812 the government proposed punishing machine-breaking with death. 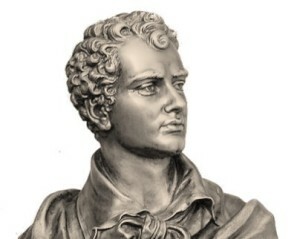 Lord Byron made a passionate speech against the Government in the House of Lords. But the Frame Breaking Act was passed. People convicted of machine-breaking could be sentenced to death. What happened next in Byron’s life? February 1812: Byron’s maiden speech in the House of Lords. He fiercely opposed legislation that would mean the death penalty for Luddites. March 1812: Byron becomes ‘famous overnight’ when his poem ‘Childe Harold’s Pilgrimage’ is published. Early 1816: Scandalous break up of marriage. Byron goes abroad, never to return. 1823: Sale of Rochdale estates agreed with John Dearden who became Lord of the Manor. 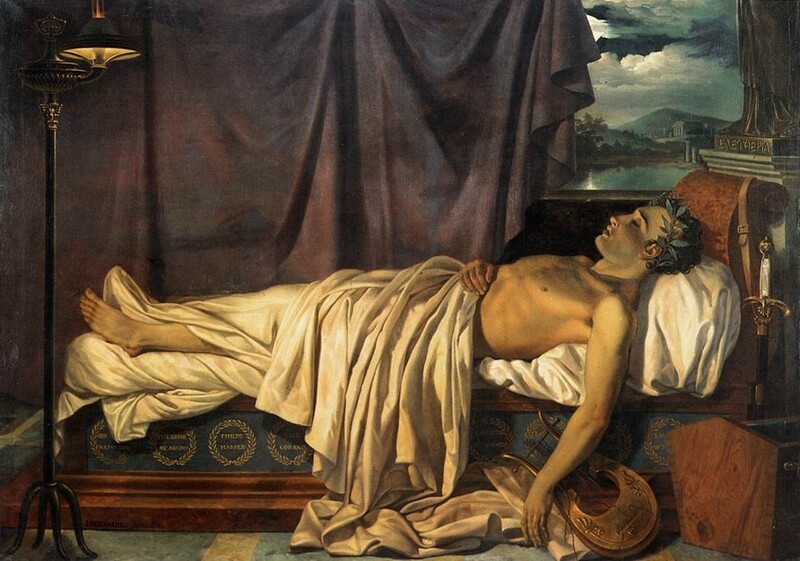 April 1824: Byron died in Greece aged 36. Why was Byron visiting Middleton? Byron owned property in Rochdale. He was selling it as he was short of money. From about 29th September to 7th October 1811. No, he was almost unknown. He became famous a few months later. What do we know about the owners of Hopwood Hall? They were Robert Hopwood and his wife, Cecelia Byng, the Queen’s lady in waiting and sister of the Prince Regent’s close friend, ‘Poodle’ Byng. Was anyone else famous there? Captain Hoste, a naval hero: the original of Jack Aubrey in ‘Master & Commander’ as played by Russell Crowe. Did Byron write his famous poem, ‘Childe Harold’, there? No. He had written it abroad. But he altered it at Hopwood and he probably wrote passionate new verses. Local histories plus a description written by Miss Mary Lovedaywho wrote ‘A fellow guest writes’ above. Visit Anne’s website: http://www.childeharold.co.uk for more about Byron and the Byrons.